Corpus Christi Parish has been a place to bring families together since 1913. It is a vibrant Catholic community where you can build relationships with others and strengthen your bond with your family and with God. We provide positive Christian values and education in conjunction with St. Clare Elementary School in O'Fallon, Illinois. In 1912, Father Grootens became the assistant at St.Peter's Cathedral of which Shiloh was parish territory. Fr.Grootens soon saw the need for a Catholic in the Shiloh Village. The farmers of the area had means of transportation to attend the Cathedral but the large number of coal miners from the Shiloh mine did not. Bishop Janssen gave Fr. Grootens permission to build a church. The Bishop then purchased two lots from Lizzie Rasp for $160 on which the church now stands. He also purchased 4 lots across the street from Josperh Rasp for $425 which is now used for the parish center and parking lot. The cost of the church was approxmately $7000 and a $500 grant was received from the Extension Society with the provision that the church would be named "Corpus Christi" in honor of the Blessed Sacrament. A class room was built onto the church to be used as a parochial school with a large sacristy that could serve as a temporary residence for the visiting priest. Due to the large debt, it was decided to build a large chicken barn and use the profits of raising chickens to reduce the parish debt. The parish was organized in Janury 1913 and Mass was offered in the town hall until the new church could be built. The foundation was dug in March 1913 and on July 30, 1913 the church was formally dedicated. The church was complete in every detail at the time of the dedication. The pews that were restored after the Cathedral fire in 1912 were given to Corpus Christi. The parish consisted of 34 familes at its beginning. According to records the first person baptized in Corpus Christi parish was Jospeh Ribitzki on January 18, 1913. Hilda W. Schubkegel was the first person baptized in the new church on March 18, 1914. Most Reverend Henry Althoff, Bishop of Belleville, officiated at the first Confirmation on May 2, 1915 for a class of twenty-six. The marriage of Walter Jorn and Annie Vernier was the first wedding on May 30, 1916. The first school for the parish was started in the fall of 1913. There were forty-one students in eight grades and the teacher was Miss Hilkemeier of Westphalia, Mo. The school operated for only one year because it was too great a financial burden on the young parish. Throughout the years a religion class was held on Saturday or Sunday. In the 1930's the children were permitted to attend St. John's Orphanage for religious instruction. In 1957 forty-five children from Corpus Christi were enrolled in the orphanage school. The following year there were seventy students enrolled. In 1960 a new school was built at St. John's and Corpus Christi parish agreed to financially contribute to its operation. In 1983 the Diocese closed the doors of St.John School much to the disappointment of the students and parents. Corpus Christi parish is now a full partner with St. Clare and St.Nicholas parishes in O'Fallon in operating St. Clare School and the children from Corpus Christi parish attend St.Clare School. Over the years many improvements and changes have been made including construction of the parish rectory in 1974 and the parish center in 1992. The parish has grown from the original thirty-four families to 365 houesholds. 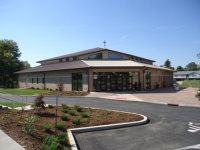 In September 2011 we moved into our new church which holds over 400 parishioners. In 2012, the old church was striped of its pews, a new carpet was laid, and a new classroom was constructed where the alter was. The building was renamed Grootens Hall in honor of the Rev. John Grootens, our very first pastor. Grootens Hall contains three classrooms for our PSR program, or a meeting room for a special event.